Getting Crafty with Jamie: Start your day off right! I'm starting to bubble. Yes, bubble. I know it sounds odd but it's how I feel! Lol. With Convention next week I'm starting to bubble with Excitement! So I was up at 4, then 5:30am between tooth pain (recovering from dental surgery this week) I decided I couldn't skip the gym!! I am now standing, preparing to go deliver some orders after having killed spin class in this humid heat lol. 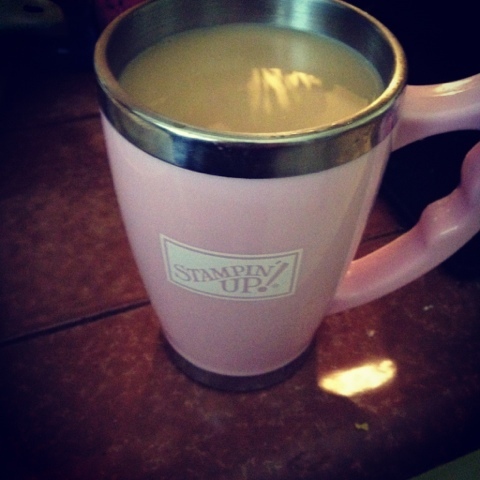 Hot or not, I fill my cup up with Chocolate Glazed Donut coffee from my Keuirg in my fancy Stampin' Up! Mug and I toast the day! To you... Humid, muggy day... You are bound to only get better and I'm going to be Stampin' the day away in prep for Convention! I hope your day is great y'all!